Palestinian health officials reported 205 people killed in the strikes, which targeted numerous Hamas compounds, bases and weaponry storage facilities. Defense officials estimated Saturday that Israel could expect around 200 rockets and mortar shells a day during the operation. The officials said the operation would involve mostly the IAF, which is using precision weaponry to obliterate Hamas' underground facilities, but added that other forces may be sent in if necessary. The IAF is currently preparing for dozens of daily sorties into Gaza. Unmanned aircrafts will also assist with gathering intelligence. "I don't want to mislead anyone. This won't be easy and it won't be short, but we must be determined," he added. "The time has come to act. We do not go to this clash gladly, but neither are we afraid of it. We will not let terrorists hurt our citizens or soldiers. We will do what is necessary. 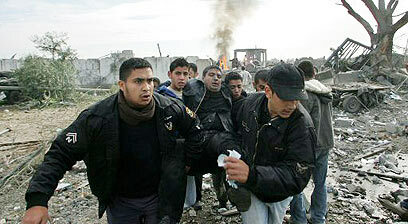 For weeks Hamas and its affiliates lobbed Qassams and Grads and mortar shells on the towns and communities of the South. We have no intention of allowing this situation to continue." The defense minister detailed the launch of the operation: "In the afternoon IAF aircraft attacked Hamas and terror targets in the Gaza Strip. In this strike the IAF hit more than 190 Hamas operatives, including senior police officials, and destroyed infrastructure used by the terror groups. See all talkbacks "Barak: It won't be easy, it won't be short"